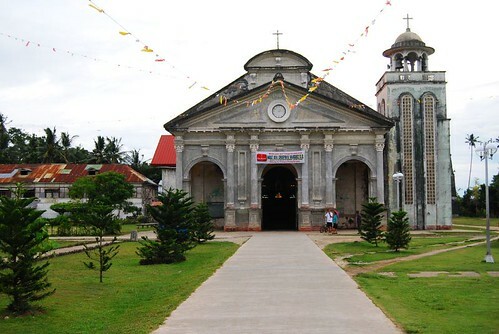 The church of St. Augustine stands on the southwestern side of Panglao Island, and is 18 kilometers from Tagbilaran City, the capital of the province of Bohol. It snugly nestles on a plain, its back close to the seashore, its right side facing a big, wide plaza which serves as the venue of the town’s many religious and social activities. 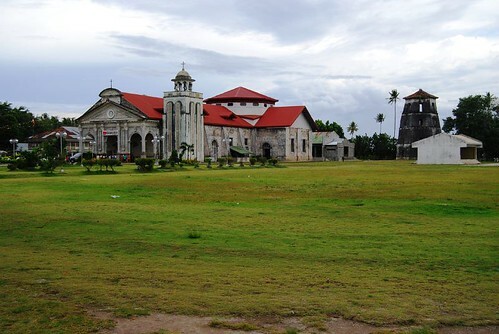 In addition to the massive stone church which is clearly of Spanish-time vintage, one can see across the spacious plaza other landmarks of Spain’s occupation: the watch tower, said to be the tallest of its kind in the Philippines, and the old municipal building and school houses made of huge stone blocks. 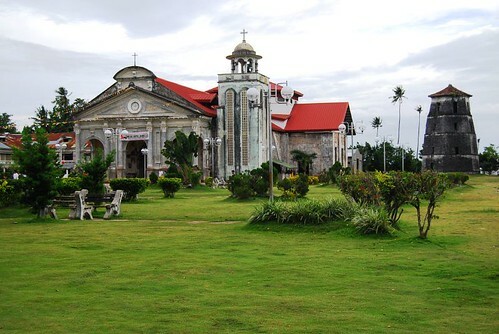 The church can be reached from Tagbilaran City by vans and cars, or the cheaper way by the jeepneys and mini-buses that ply the Tagbilaran – Panglao routes. All three routes to Panglao from the capital converge in the area where the St. Augustine Church stands. Fare: P20. 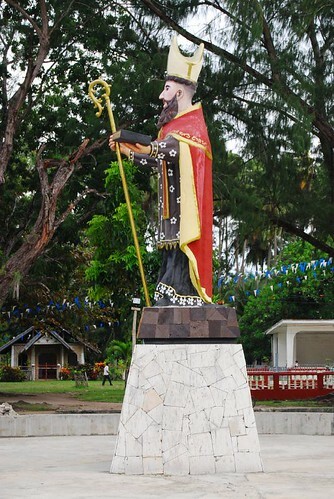 In the records of the diocese, Panglao was established as a parish by the Jesuits in 1782. The Recollects’ records show that they took charge of Panglao town in 1803. The extant church, imposing and awe-inspiring especially if viewed from its right side, stands beside the ruins of an older church, probably from Jesuit times. The ruin’s façade indicate that it may have been Baroque in design. This church was ruined before 1886. Church records show that a provisional church, made of tabigue and wood, was constructed. To the rear of the ruins, further off to the seashore, stands a 5-storey bell tower built of cut stone in 1851. Octagon in shape and covered by a pitched roof, the tower is said to be the tallest of its kind in the Philippines. This tower as a heritage of the past needs urgent restoration. Rev. Fr. Valentin Utande, a Recollect, started building this church in 1894 up to 1897 when he was transferred to another parish. Two other Spanish priests, Rev. Fr. Eugenio Gil and Rev. Fr. Pedro Jimenez continued the construction slowly until 1898 when the Filipino revolution against Spanish authority broke out. The construction was abandoned as there were no more Spanish priests assigned in Panglao. In 1912, Rev. Fr. Emiliano Veloso was assigned parish priest and he continued the construction with the whole-hearted cooperation of the church leaders, town officials, and residents of Panglao. A greater part of the nave was done in 1920, and by 1924, even if still unfinished, a 4-day inauguration affair was scheduled, with Bishop Juan B. Gorordo of Cebu celebrating the Inaugural Mass and Blessing on Sunday, August 31, 1924. The church’s concrete façade has the typical portico-façade with fancy Corinthian capitals. The portico and bell tower, both added later, blend well with the original character of the church. There is the choir loft, usually found in Bohol churches, above the main entrance. In cruciform, the church has had extensions to accommodate the growing faithful. There are three richly carved retablos or altars in front, all closely placed to the wall. The main or center retablo, facing the nave, has the icon of the patron saint, St. Augustine, a doctor of the church, occupying the upper center niche. Beneath this, to the left, is the niche for St. Joseph, the foster father of Jesus, and to the right, that of the Blessed Virgin Mary. Above the main altar is a dome, its base hexagonal in form, and its ceiling filled with a mural of the Blessed Trinity surrounded by eight divisions of angels. The St. Augustine church is famed for its ceiling murals. Above the nave are paintings depicting the seven sacraments. Above the sacristy are paintings of the patron saint, the Last Supper and the Blessed Trinity. Unlike many churches, this church has retained and renovated its communion rails. Also still in use are two antique wooden confessionals, richly carved with grape-vine, flower and dove patterns. The huge, massive convento, L-shaped in form, is made up of masonry at the lower level, and of wood at the upper level. Part of it has been converted into a Catholic high school, the SAGA or St. Augustine Academy. In front of the convent are the ruins of the lower façade of the original stone church, now incorporated into an outer grotto. The whole town celebrates the fiesta of their patron saint, St. Augustine, on the 28th of August. Every chapel in the different barangays has also their own patron saint, such as Santa Cruz, San Vicente, San Roque, or the varied affiliations of the Blessed Virgin Mary. They also celebrate, individually, their own fiesta. Of 20th century vintage is the devotion to the Santo Niño del Panglao where the faithful of the main church and all the chapels observe the novena of the Child Jesus and converge in the vast town plaza, with all the trimmings of a fiesta celebration, on the last Sunday of January which marks the end of the novena. There are three Masses on Sundays: 6:30 am, 8:30 am, and 5:00 pm. 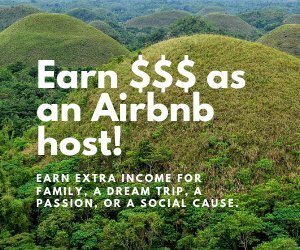 There is one Mass for ordinary days: at 6:30 am for M-T- Th-S and at 5:00 pm for W-F.
As it is, the Island of Panglao is currently a major tourist destination, with its well-known lovely white beaches, exquisite cuisine, friendly people, and accessibility. With a new international airport in the making in the island itself, the place is bound to become a booming metropolis someday.